A Frida Kahlo Pottery Painting Evening! If you've ever visited us before, no doubt you would have spotted numerous homages to Frida Kahlo dotted about the shop. And there's a reason for that; we absolutely LOVE her. We don't know if it's her attitude to life, or the honesty in her art, or perhaps something else altogether; but we find her and her work incredibly inspiring. So with Frida's birthday month of July coinciding with the new exhibition at the V&A, we saw the perfect opportunity to dedicate an evening to the lady who motivates us so much. On the 12th July we will be hosting an evening of pottery painting, with nibbles, BYOB, free Frida-esque portraits by guest illustrator Fern Eleanor, fancy dress (optional), flower hats and hopefully... Frida Fun! So if the sound of an evening painting Frida-inspired pottery with friends sounds appealing to you, buy your tickets at £23pp to paint a mug, plate or bowl via Eventbrite here, give us a ring on 01273 628 952, or you can pop into the shop to buy them. We're really excited and if you're coming, hopefully you are too! It's sure to be a great night. Prints, portraits, plates, paint, pottery...pappas! All the best things in the world, and all something we cater for! This week we've had some really adorable pottery come through our kilns for some very lucky dads, but there's no pressure if you haven't sorted your gift out yet, because you still have plenty of time to come by the shop and do some painting! To be ready for the day we'd recommend coming before the 14th June. 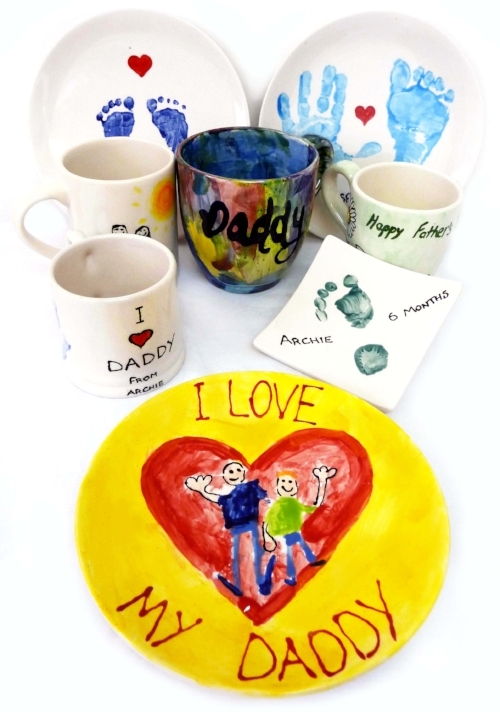 Make a masterpiece mug with a message of appreciation, blow him away with a beautiful bowl covered in handprints, or paint a portrait on a plate...there's so many options to choose from! (Insider knowledge: most people pick out really huge mugs for their dad, apparently dads are giant tea guzzlers across the board? Who knew! If you like to give gifts that are more about having an experience together, then book in to come for a painting session! Alternatively (for 12+ yrs), we offer taster throwing sessions which are a really hands-on, fun way to spend some time with dad, learning how to make a couple of small pots on the potters wheel, which you can come back to paint a couple of weeks later together. We sell gift vouchers in the shop, or over the phone on 01273 628952. And last, but certainly not least, on Father's Day, we will have complimentary coffee and cake for any dad visiting us, so really, can there be a better way to spend the day together? We can't think of one.